Order Desk can import orders from your shopping cart(s), sync in your print details and then automatically send them on to Jondo Global for fulfillment. When orders are shipped, the tracking details will be sent back to Order Desk automatically. This guide will go over the Jondo Global integration settings and features. For thorough details on how to work with your print on demand orders in Order Desk, please read through the Print on Demand Fulfillment guide. To connect to Jondo Global, click on the Manage Integrations link in the left sidebar. Under the Print on Demand tab find and enable Jondo Global. When you receive your API connection details from Jondo, enter them in Order Desk. When you initially connect to Jondo, you'll be connected to the staging environment to run some tests. 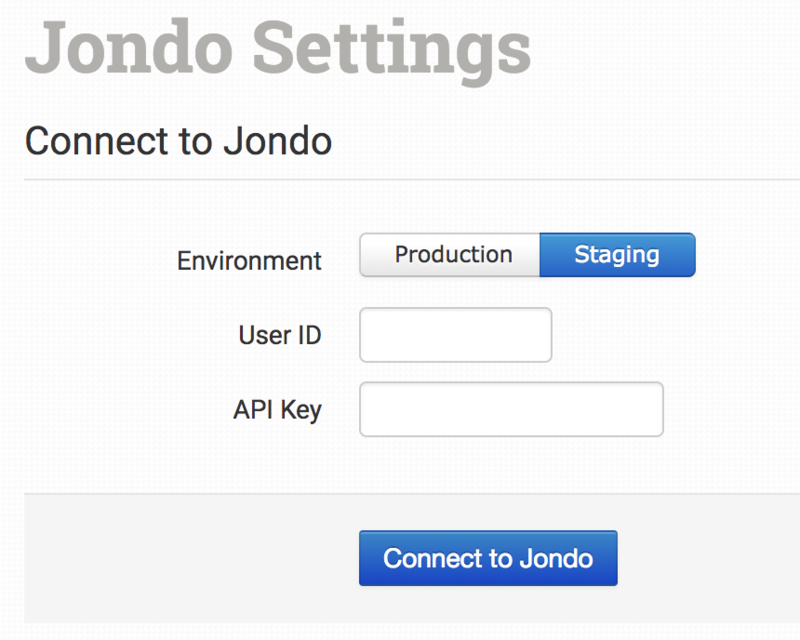 Once testing is completed, if your production credentials from Jondo are different from your testing credentials, you will need to disconnect the Jondo integration by clicking on the Disconnect button at the bottom of the integration settings. Re-connect to Jondo using your production credentials instead. Once you have successfully connected to the Jondo Global integration, you will have some settings to go through to add your preferences. Choose the shipping class you want Jondo to use for your orders. Please double check pricing with Jondo directly as Standard may be a more cost effective option for you than Economy. If you need to apply specific methods for certain orders, match your method names to Jondo's names in the Shipping Class Match section below. Select the folder you want orders to be moved into after they are successfully sent to Jondo. Select the folder you want orders to be moved into when Jondo sends tracking details back. Select the folder you want orders to be moved into if they are canceled at Jondo. Some shipping companies require a phone number. Add your phone number here as a backup in case a customer did not add theirs. Give this notification URL to Jondo. They will use it to connect to your Order Desk account and send shipment details back to your orders automatically. If you have more than one Jondo integration set up in Order Desk for the same Jondo account, you will need to setup notification URL redirects following the instructions in the next section. If you have Jondo connected to more than one Order Desk store for the same Jondo account, instead of adding the notification URL for each connection to Jondo, add any additional notification URLs from other connections to your primary account. Add one URL per line. When Jondo ships your items, these redirects will help the shipments find their way back into the Order Desk store the orders came from. If you want Jondo to print and include your custom brand on the materials they send with your orders, add the URLs here. Please speak with Jondo if you need more information about what they need from you. If you need to override these URLs on an order by order basis, you can do so with checkout data following the guidelines in the Preparing Your Orders section below. The packing slip is a Jondo design, but they will include your custom branded images to the front and back if you supply the files. The packing slip front and back URLs must be JPG files. If you are sending a PDF file, Order Desk will automatically convert it to JPG. Select Yes if you are sending images to Jondo to be laid onto the front and back of their packing slip. Select No if you want to have Jondo print your own custom packing slip. You can add your own packing slip PDF URL to your orders or use Order Desk to create a custom packing slip. The Customer Logo will be printed directly on the product itself. If you want Jondo to include your logo on the printed product, add the logo file URL here and be sure that you've prepared the file according to the proper specification. For more information on what the product settings within the Jondo integration do, please read the Print on Demand Product Settings guide. If the shipping methods you set up in your shopping cart(s) don't match the shipping method names Jondo uses, they won't know what methods you intend for them to use. When this happens, the default shipping class applied above will be used instead for all of your orders. To tell Jondo what methods you want them to use, you will need to match your method names to theirs. This can be done in the shipping class match section. For detailed instructions on setting this up, please read through the shipping class match guide. If you need to have access to specific carriers on your account that aren't currently available in the shipping class match dropdown, please contact Order Desk Support to get them enabled. Sending orders to Jondo will initially take some preparation before it can happen automatically. For complete instructions on how to use Order Desk with your print on demand orders for Jondo, please take a few moments to read through the Print on Demand Fulfillment guide. All packing slip and inserts/stickers can be set in the Premium Branding URLs section above. The same fields you see here are for overriding the URLs on an order by order basis. If you are unfamiliar with checkout data, please first read the How to Work with Checkout Data guide. or PackingSlip The URL where the PDF is stored for the front of the packing slip. PackingSlipBack The URL for the back of the packing slip. UseTemplate Override the default setting on the integration settings page. If sending images to insert into a template, set to 1. If sending a PDF (which will be converted to JPG automatically), the value will automatically be set to 0. InsertCardOutside The URL for the outside of the card insert. InsertCardInside The URL for the inside of the cart insert. Sticker The URL for the sticker image. CustomerLogo The URL for the customer logo that will be printed on the order items. UrbanizationCode The urbanization code for the order if it is being sent to Puerto Rico. Replace the "x" with a value specified in the table, i.e. print_url_1 or print_url_2. print_sku Use the Jondo Product Code for your print_sku. Do not use the Jondo Print SKU. print_url_ x The location of the printable file. For print_url_x, values 1-8 are accepted. If you are only sending one printable artwork file to Jondo, you can use print_url or print_url_1.